"The Bitter Man and the Sea"
On Mike & Molly Season 5 Episode 22, Mike has to tell Carl that he's uninvited to Molly's anniversary cruise after his breakup with Victoria on the season finale. "Near Death Do Up Part"
On Mike & Molly Season 5 Episode 21, after suffering a near death experience while on the job, Carl shares with Mike that he plans to propose to Victoria. 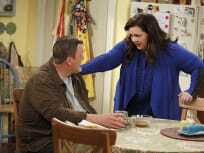 On Mike & Molly Season 5 Episode 20, Molly becomes angry with Mike when he fails to listen to her vent about writing and they take a day apart. 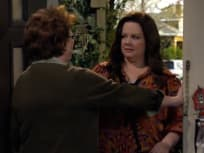 On Mike & Molly Season 5 Episode 18, Peggy's best friend, Kay comes for a visit bringing lots of emotional baggage which Molly tries to help her unload. 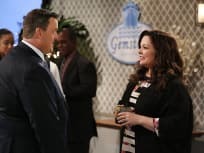 On Mike & Molly Season 5 Episode 17, Molly takes Peggy on a road trip to her hometown of Mudlick and surprises her with a visit from her sister. On Mike & Molly Season 5 Episode 16, Mike isn't happy when Molly says she doesn't want him to attend a party being thrown by her publisher. On Mike & Molly Season 5 Episode 15, Mike makes what may possibly be a bad decision when he celebrates reaching one of his weight-loss goals. 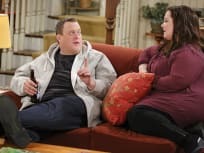 "What Ever Happened to Baby Peggy"
On Mike & Molly Season 5 Episode 14, Molly becomes annoyed when Peggy makes her do chores in exchange for enticing stories from the past. On Mike & Molly Season 5 Episode 13, when Molly's book finally comes out she's elated but becomes paranoid that no one will actually buy it.